On Saturday we *finally* got to put up a Christmas tree! Pete and I didn't get to do ours this year because we left Toowoomba at the end of October and Pete said that October is too early to do the tree. Grinch!!! 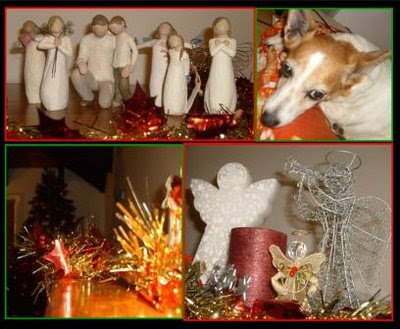 So anyway, we had to wait, because in the Buma house we aren't allowed to start Christmas till after Mum's birthday (December 3). 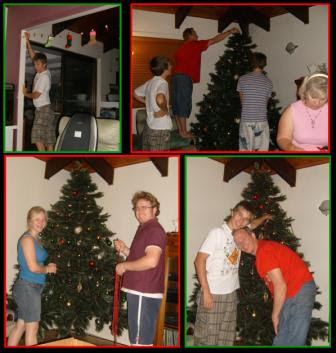 (Clockwise from top right) Jordan stringing the christmas card pegs, Papa tries to make the star stay, while Jordan and Lockey watch, A candid shot of Alexie and Peter decorating the tree (not), Papa and Jordan posing. Our centre piece... my brainwave the family christmas tree. I made these name baubles last year (to replace the apples we've had since I can remember), and they usually go on the tree, but they're kind of lost there. 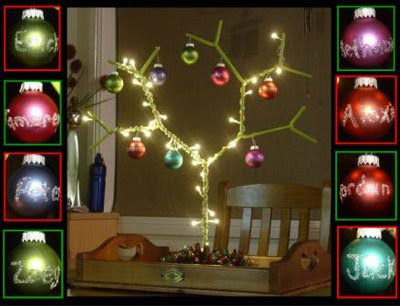 So this year, I bought this cool tree from Ikea, wrapped some pretty LED lights around it, and hung our name baubles from it. We've lost Tess (the other doggy) though :( I'm not quite sure where she's gone, so I'll have to make her another one. 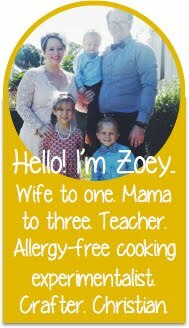 We're also going to make a 'baby bump' one that can be used whenever someone in the family is pregnant! I've just realised that I don't have a proper picture of the finished tree... I'll get back to you!